Dozens, maybe hundreds, of dead grey seal pups have washed ashore on beaches in Eastern Nova Scotia. Whether more dead seals are still adrift is unknown, as is the location where they died and the cause of death. Although local residents are alarmed and have not seen a seal die-off like this before, DFO has suggested this occurrence is normal. Although this wave-swept open Atlantic shoreline has not noticeably frozen over, DFO has suggested these seal pups died because they were crushed by ice. The carcasses are of young seals, only weeks old and recently weaned. Many still have the whitecoat from birth, indicating they were too young to swim when they died. Superficially, these seals do not appear to have died from starvation, shark attacks, or been killed by fishermen. So, why did they die? And, does it matter? DFO indicates post-mortem exams are not warranted. However, other modern societies consider incidents like this one to be investigation-worthy, and they use the expertise of veterinarians to try to understand the significance of the deaths for the natural world, and for humans. 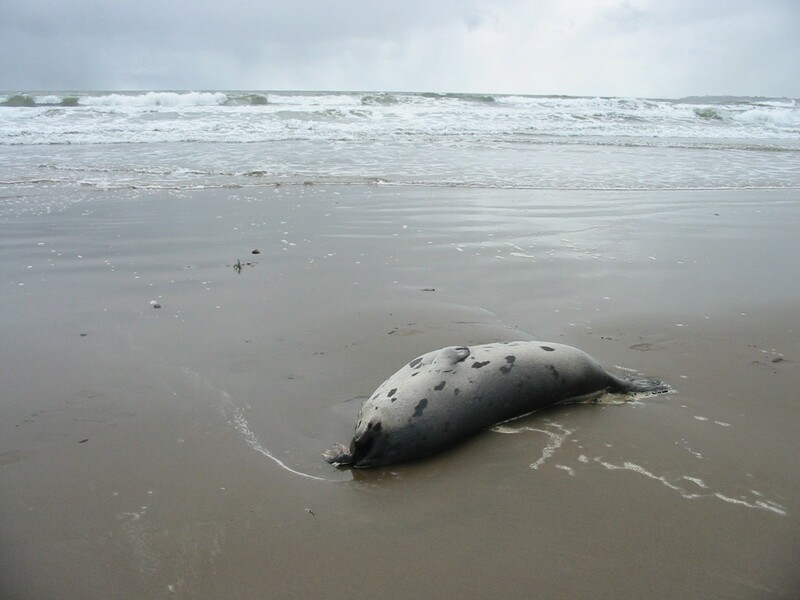 For example, in the United States, and on the west coast of Canada, protocols for examining stranded (including dead) marine mammals direct that the physical health status of these wild animals be studied at every opportunity. Seals, as top ocean predators, are recognized as indicators of ecosystem health. Also, since seals can transit multiple infectious disease threats to humans, pets and livestock, it is elsewhere considered prudent to test for these threats whenever possible. In Europe, and in the United States, seal rehabilitation facilities monitor health of seals, and diagnose and treat sick animals. Contagious disease epidemics have sometimes rapidly killed large numbers of seals. However, it seems this particular seal die-off might remain another unsolved riddle in Atlantic Canada, perhaps for political reasons. Along with the failure of cod and all the other formerly-big fish to grow as they did in the past, the mysterious deterioration in the herring and capelin stocks, starving seabirds, and the disappearance of many other forms of marine life. 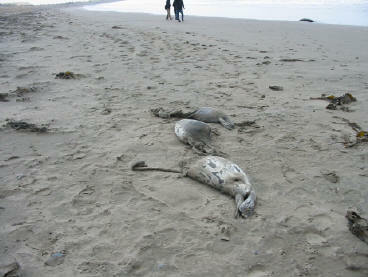 Undoubtedly there is a common thread here, and these seal deaths might carry a subtle warning. The Grey Seal Conservation Society (GSCS) again recommends the Federal and Provincial governments remove their heads from the sand. Any opportunity, including any commercial killing of grey seals or an unexpected die-off like this, should be used to carefully examine the health of these key marine mammals. That means doing more than a head count and asking what they eat. Grey seals represent the last large marine predator surviving in any numbers in Nova Scotia waters, which is a reason to safeguard them. Also, grey seals are apparently now being marketed for human consumption. Appropriate handling of this incident should include sanitary carcass disposal and a public warning to avoid contact with dead seals, including contact by pets. And, of course, a moratorium on grey seal hunting.